Ozhotels is a group of independently owned and non-related hotels, resorts and serviced apartments situated in the holiday destination of Alexandra Headland on the Queensland Sunshine Coast. Ozhotels allows you to deal directly with the apartments and resorts, therefore giving you the best possible rates for this Alexandra Headland accommodation. 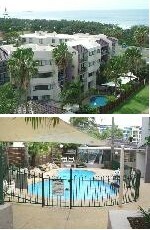 So book your next resort or apartment holiday accommodation in Alexandra Headland online and get great discount rates. The popular holiday destination of Alexandra Headland gives travellers from all over the world a huge choice of places to stay, ranging from fully self contained holiday apartments and luxury resorts through to affordable hotels and budget motels. This wide variety makes finding the ideal place that suits all of your holiday needs a difficult and time consuming task, which is why many people like to use the free services of an accommodation expert like OzHotels. Doing this allows them to compare hundreds of different properties that are situated all over Alexandra Headland, in order to find the one that meets their specific requirements and travel budget. The main advantages of booking online with OzHotels is that you can book your travel up to 12 months in advance and that you will be able to get an extra discount off the already cheap rates the longer that you holiday in Alexandra Headland. The Oaks Seaforth Resort at Alexandra Headland overlooks the clear blue waters of the Pacific Ocean and is only a few metres away from the patrolled surf beach at Alexandra Headland. This amazing holiday location, along with the spacious and luxurious nature of the fully self contained apartment accommodation makes the Oaks Seaforth Resort the best place to stay on Queensland's picturesque Sunshine Coast. There is a range of guest resort facilities at the Oaks Seaforth Apartments incuding an on-site restaurant, bar with wine cellar, gaming lounge, outdoor swimming pool, spa, sauna and gymnasium. This ensures that holiday makers and families staying at the Oaks Seaforth Resort have a truly memorable Sunshine Coast holiday. The magnificent ocean front location of the Headland Tropicana Resort means that this fully self contained Alexandra Headland accomodation is the perfect destination for your next relaxing family holiday. 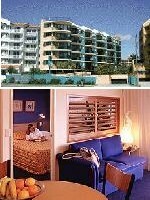 The spacious, fully self contained and air conditioned 1, 2 & 3 bedroom apartments at the Headland Tropicana Resort overlook the sparkling swimming pool and are set in lush tropical garden setting. The resort styke facilities at the Headland Tropicana Resort include cable TV & DVD player, internet access, 1/2 size tennis court, heated indoor swimming pool, spa, sauna, games room and secure underground car parking. 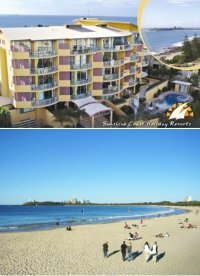 Ideally positioned on the Sunshine Coast's Alexandra Headland and close to the beautiful surf beach the Headland Tropicana Resort is the best value for money family holiday destination on the Sunshine Coast. The rooms at the Alexandra on the Pacific Apartments comes complete with warm and friendly service that is tailored to your every need. The helpful staff at this Alexandra Headland accommodation can organise tours, suggest nearby walking trails and recommend the best eateries, which are located only a short walk away. Every apartments at the Alexandra on the Pacific have magnificent views of the sandy beaches, blue ocean and Glasshouse Mountains from the spacious balcony. Decorated in a coastal theme and thoughtfully equipped these Alexandra Headland apartments are designed for maximum holiday pleasure and are unmatched in size and quality. They are ideally perched above a secluded beach and are also only a few steps from everything that Mooloolaba and the Sunshine Coast have to offer. When you have finished exploring the secluded beach you can put your feet up and relax in a deckchair on the terrace or in the heated pool and spa with its beautiful ocean view. Alternatively you can take a sauna, get fit on the gym and fitness equipment or take a day tour of Cooloola National Park or the World Heritage listed Fraser Island. Luxury family beach apartment accommodation on the Alexandra Headland, on Queensland's tropical Sunshine Coast. 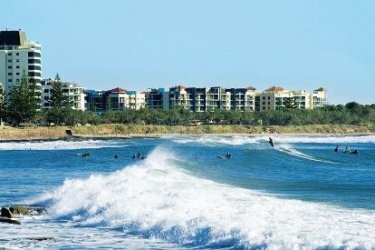 The Northpoint Holiday Apartments are ideally situated on the Alexandra Headland, between the Sunshine Coast townships of Mooloolaba and Maroochydore. The rooms at this beach front property consists of spacious, fully equipped 2 bedroom apartments featuring air-conditioning, private laundry facilities, DVD player, Free Austar cable TV and a private balcony with magnificent ocean views from most apartments. Whilst staying in this affordable Queensland holiday accommodation you can make use of the BBQ area, heated swimming pool and pristine beach with the Alexandra Headland's surf club only 200 meters away and a leisurely 5 minute drive to the Sunshine Coast's leading shopping centre. This cheap Alexandra Headland accommodation offers truly remarkable family sized holiday apartments directly opposite the patrolled Alexandra Headland beach at a fantastic budget price. For more Alexandra Headland Apartments click here. Very rarely does the opportunity arise to stay in brand new 4½ star resort accommodation on the Sunshine Coast overlooking the picturesque blue waters of the Pacific Ocean. At the Ocean Vista on Alex Apartments such an opportunity exists. Nearby to these 18 luxurious apartments are the pristine beaches of Alexandra Headland and the relaxed shops and restaurants of Mooloolaba. The Sunshine Coast's glorious climate and fabulous beaches are what makes people come back to this extraordinary part of Queensland. The ground floor apartments at the Ocean Vista Apartments feature courtyard terraces while the apartments on levels 2 and 3 each offer private roof top gardens which are ideal for relaxing in the sunshine, enjoying a BBQ and marvelling at the ocean views. Ocean Vista on Alex is centrally located, enabling you to experience idyllic Alexandra Headland accommodation in one of the newest resort developments on the Alexandra Headland. 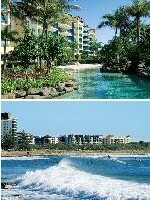 The friendly staff at the Ocean Vista on Alex Apartments can arrange your airport transfers, car hire, a game of golf, discounted entry to Underwater World and other tours and attractions in and around Mooloolaba, Alexandra Headland and the Sunshine Coast. The Mylos Holiday Apartments on the Queensland Sunshine Coast is a fantastic place to bring the whole family for your next holiday. The resort facilities at this Alexandra Headland accommodation includes a children's pool area with small slide, 2nd larger swimming pool, children's games room, poolside BBQ area, sauna, restaurant and free undercover car parking. 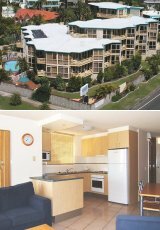 At the Mylos Holiday Apartments all of the fully self contained Sunshine Coast apartments have a private laundry, cable TV and a balcony overlooking the Pacific Ocean. The friendly resort managers at this Sunshine Coast accommodation will ensure that you and your family have a wonderful, relaxing Sunshine Coast holiday. With the beach, shops, restaurants and public transport only a short walk away from the Mylos Holiday Apartments in Alexandra Headland this really is the ideal holiday destination. There is even large rate discounts for longer stays at the Mylos Holiday Apartments, Sunshine Coast. 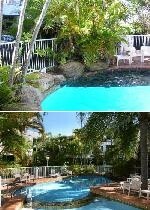 The Headland Gardens Holiday Apartments is a remarkable tropical oasis in the middle of the Sunshine Coast. The Headland Gardens Holiday Apartments is a 3½ star family friendly holiday resort which features 1, 2 and 3 bedroom apartment accomodation spread over 3 levels. All of this is ideally positioned on the delightful Alexandra Headland in the heart of the magnificent Sunshine Coast. All the spacious fully self contained apartment accomodation at the Headland Gardens Holiday Apartments come complete with a private balcony or patio which overlook the lush tropical gardens surrounding the resort. This Alexandra Headland accommodation has either a view of the beach with a lovely ocean breeze or the tropical swiming pool. Guests can relax by the heated tropical pool, play a game of tennis or wind down in the spa, sauna and steam room. When you stay at the Headland Gardens Holiday Apartments you can visit all the local tourist attractions on the wonderful Sunshine Coast or simple take a break from your busy work life and relax at the resort. The Ocean Boulevard Apartments on the beautiful Alexandra Headland are fully equipped with luxury items to make sure that your next holiday to the Queensland Sunshine Coast is unforgettable. This Sunshine Coast holiday accommodation is ideally positioned within close proximity to restaurants and shopping in Mooloolaba and also feature a heated swimming pool, spa, covered barbeque and gazebo area and free secure undercover car parking. Guests staying in this 4 star Alexandra Headland accommodation will have easy access to Steve Irwin's world famous Australia Zoo, Underwater World and Aussie World. 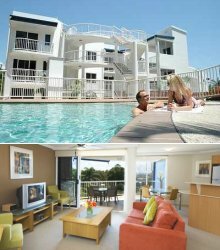 The Mariner on the Pacific Apartments is a luxurious resort in Alexandra Headland on Queensland's favorite holiday destination, the Sunshine Coast. 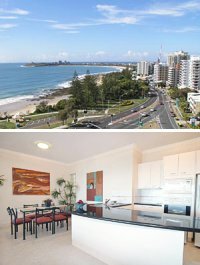 This spacious Alexandra Headland accommodation is superbly positioned on the highest point of the Alexandra Headland and provides guests with not only the best Ocean View on the Sunshine Coast but also with easy access to the nearby pristine white sandy patrolled beaches. There is a multitude of tourist attractions nearby to the Mariner on the Pacific Apartments including the Aussie Zoo, Under Water World, Ettamogah Pub, Big Go-Kart Track and Big Pineapple as well as numerous alfresco restaurants, cafes, shops and entertainment venues in Mooloolaba itself. A leisurely drive from the Mariner on the Pacific Apartments and you can experience the Hinterland townships of Meleny, Montville and Mapleton which are renown for their art and craft, as well as the Eumundi market which is a must for all tourist travelers to the Sunshine Coast. Alexandra Headland is only a 1 hour drive North of Brisbane only a 10 minute drive from the Maroochydore Sunshine Coast airport.